It really does not seem like four whole weeks have passed since we enjoyed a fantastic night at The Sausage Emporium. Time certainly does fly when you are having fun! I have been dying to take hubby to the The Fat Hippo Underground after a fantastic night with my friend when it first opened (read that review here) and had heard so many good things about dAt bAr that is seemed obvious to combine the two on our next date night. My brother and his girlfriend tagged along too. 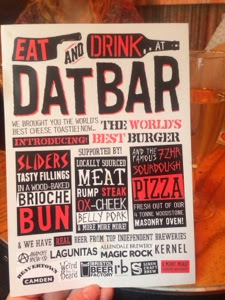 dAt bAr is located to the side of the Theatre Royal on Market Street. It is an independent bar specialising in craft beers, great wine and fantastic coffee. They serve pizza and burgers too which is now definitely on our radar for our next lunch date. 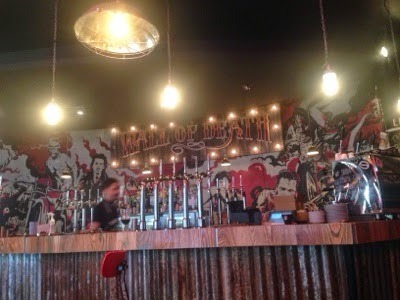 The atmosphere is informal and not pretentious at all (unlike some of the bars in the area) - a retro comic book-style interior, a 'wall of death' bar, an eclectic soundtrack (which we loved) and a wide mix of customers make this bar a lovely relaxed place to meet with friends. The men were very impressed with the huge variety of beers on offer - ranging from old favourites to something more unique. The barman was happy to give recommendations and offer sample tasters. We tried 7 different beers between us and a definite favourite was one of the smoked beers which actually tasted like a BBQ in a glass. None of us had ever tried or even heard of a smoked beer so it was great to try something new. One of the things that really sets dAt bAr apart from the crowd is it's fantastic staff. I have never come across such a knowledgeable bartender (maybe he was the owner?). He was clearly passionate about his job, taking the time to make sure we chose the right drinks and even made me a personal off-menu cocktail after I asked for a recommendation which was perfect. It makes such a change to be served by an expert who wants to go the extra mile for you. We got chatting to a bloke sitting at the bar who told us he had only found this bar by chance today and the discovery had made it the best day of his life. Kind of sums up the evening and we could have stayed longer. Next time we will definitely stay for food too. We had other places to go tonight though so stumbled walked wound the corner to The Fat Hippo Underground. Blink and you'll miss the doorway - look out for the neon hippo sign above the door on Shakespeare street (around the other side of the Theatre Royal). The Fat Hippo is another one of those laid back relaxed-style restaurants we love. They focus on one thing (burgers) and do it well which is a business plan more places really need to try! The interior is rustic and stripped back - think wooden benches, exposed brick work and naked light bulbs. I love the menu and variety of burgers to choose from. A peanut butter and jelly burger and a burger with candied bacon certainly stood out as unique. We ordered wasabi popcorn (which is amazing) and cajun pork scratchings to share and then a variety of burgers. 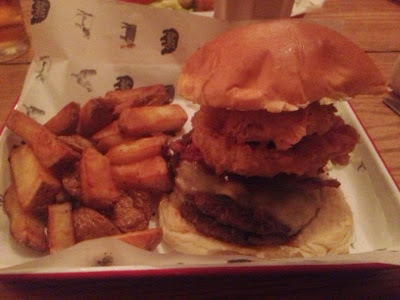 Be warned, the burgers are HUGE so make sure you visit on an empty stomach. I couldn't finish mine. We spent £15 per head which was very good value considering it included a bar snack starter, huge burger and hand cut chips and a round of drinks (including a delicious alcoholic butterbeer milkshake). We had no complaints. At the end of the evening we ended up at Lady Grey's at the opposite end of Shakespeare street. I do like the concept here - it is a lovely traditional style pub. 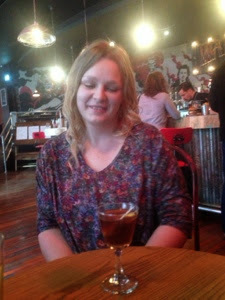 However, perhaps we had been spoilt throughout the evening as we did have a few niggles here - bar staff not knowing how to make an amaretto sour and an £11 bill for a Jack Daniel's and a bottle of beer left us thinking it perhaps wasn't the place for us. It did seem busy though so they must be doing something right. We all really enjoyed our monthly get together and are already planning where to go next time. If you've been anywhere lately that you think we would enjoy, I would love to hear your recommendations.